The hot weather continues which is lovely for swimming in the river, but not so good if you want to run horses. No matter how well they have watered the course with this hot drying day the moisture will be coming out of the ground as quickly as it is going in. 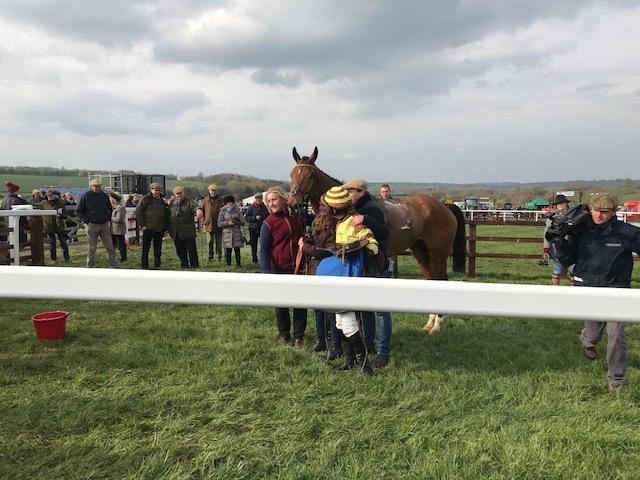 If Ted was in the first race we might have risked it but he is in the last and the ground can't be anything other than firm by then The weather is set to change at the end of the week so we will save the horses until then. 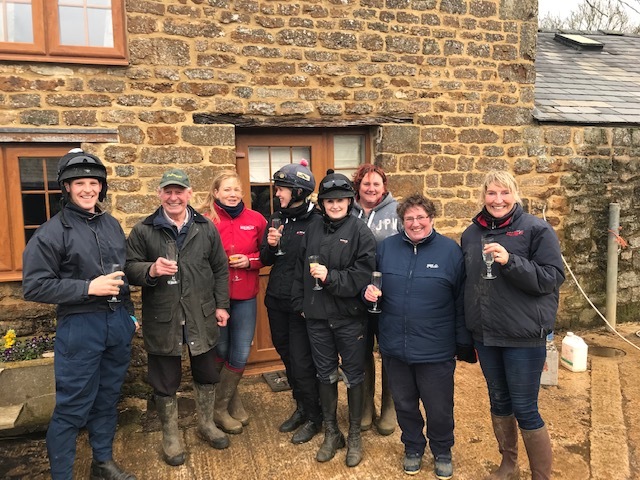 We are very lucky this season in that we have owners who haven't put any pressure on us to run horses and have put their welfare in front of getting a run. Whilst this season has been dire as far as winners are concerned we still have all the horses we started with which is the most important thing. What we want is for the horse to have an enjoyable experience racing so that they still want to race when they are older. Jarring a horse up on firm ground could put them off at best or break them at worst. I take my hat off to trainers who take the risk and get away with it but I'm not brave enough or possibly a bit too soft! We're not going to Dingley today, partly due to concerns about the ground but mainly due to Babbiloora (Pasta) also succumbing to the virus and feeling very flat during the week. We will be taking horses to Thorpe (Ted and Craig) and will see what the ground is like. We have had a busy week as it was Doug's Birthday on Monday - I organised a supper for him with some friends at The Plough at Boddington where the food and atmosphere was fabulous. On Thursday we went to Cheltenham for a Thorougbred Breeders conference and lunch followed by some terrific racing. The weather was beautiful and it was a really lovely day out. In between the moments of leisure we have been flat out with the horses, shepherd huts, fencing and spraying. As the weather is so lovely at the moment the latter three have been full on. I have just heard that there has already been two walk overs at Dingley as the ground is so firm so it would appear unlikely that we are going to Thorpe as it is so hot and even if they water the moisture will come straight out of the ground. Oh dear, so much for the Yogi Breisner sessions - Both our novice jockeys fell off!! 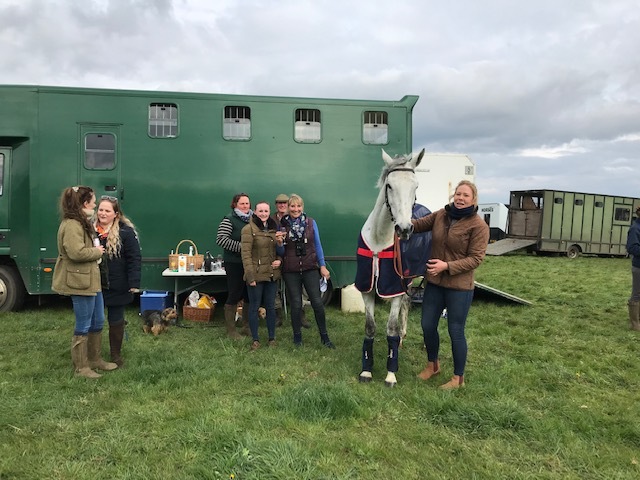 Lucy and Jess were running a cracking race and we all got rather excited when Jess moved into second three fences from home and looked as though she was gaining on Summer Sounds (Yes - Jess??!!) - It didn't last though as Lucy asked for a long stride and Jess thought differently - leaving Lucy on the turf. Gina Andrews won her 41st race of the season breaking the record for a female jockey - The record being set by Polly Curling. I got to know Polly very well when we were doing our trainers course at Newmarket and she is a lovely, unassuming lady. Indeed I had no idea that she had set the record in the first place twenty four years ago which was some feat as the season was so much shorter and trainers preferred to use male jockeys in those days. Kingsley is now very sick and could barely crawl up the gallop this morning and then bled so we now know what his problem was at Guilsborough. Having to give the horses a double vaccination because of Equine Flu has really knocked some of them back. I have spoken to a couple of vets about it and they said that it has caused all sorts of problems in a lot of yards. Giving them a flu vaccination in February when their immune system is at its lowest is the worst thing you can do and yet we had no choice. - Top Garry has still got a bruised foot but it is now almost better. It has been a long haul and he will have lost some fitness so may not be ready for this Garthorpe. It was a great lesson though and you could see the improvement in the jockeys and the horses. Yogi is quite extraordinary at spotting a tiny little fault with a jockey, correcting it and then you can see the difference in the way the horse jumps instantaneously. It is a real gift. We have just walked Edgcote and the course looks fabulous but the ground is very quick. We had a huge thunderstorm at the beginning of the week where you would have thought that the ground would have been perfect but with the frosts and the drying wind it is now fast ground. Unless it softens between now and Sunday (they are watering) we will probably only be running Jess in the members, she doesn't go fast enough to hurt herself, and surprisingly actually likes firm ground. We had some bad luck with our lovely mare Secret Getaway yesterday who did a fabulous piece of work up the hill, happily hacked back and then went hopping lame behind.. She was X-rayed and found to have a hairline fracture on her cannon bone. We couldn't believe it as we have been so careful with her and have only been working her on good ground or the all weather but Doug remembered seeing Jess kick her in the field a couple of days ago so possibly it was weakened then. She is undergoing surgery at this very moment and we are just very grateful that we had the warning without actually running her, where the leg would have most certainly broken. It has been a pretty awful season up until now - both Murphy and Budge have got tendon injuries , Garry has had a niggle in his foot (hopefully now on the mend and going to Garthorpe) Craig has had a bad back, Kingsley and Ted the virus and Pasta had the bad hock at the beginning of the season so all in all a season to be forgotten. Hopefully now our luck will change although if we don't get some rain soon I am inclined to rough them all off and write this one off! The blood results have come back for Ted and Kingsley and Ted 's show that he was clearly very sick. Kingsley's weren't great but nowhere near as bad, so at least we have got an excuse for their 'hairy goat' runs. A course of antibiotics should do the trick. Kingsley will probably be moved on as an event/hunting horse as he can't quite stay three miles and he has a lovely jump and paces. Last night we went to Ben Case's to celebrate the success of Croco Bay at Cheltenham. 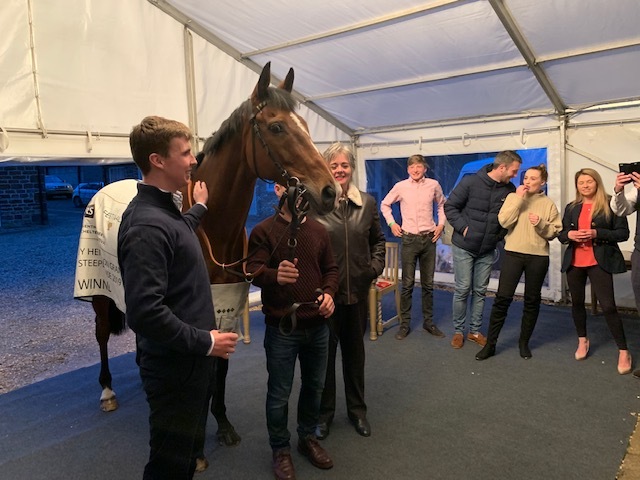 He was paraded in the marquee and then we watched the race again on the big screen - It was almost as exciting watching it all over again - Such a fabulous result and a great training feat by Ben and Sarah and 'Team Case' as he hadn't run for around eight months before the big race. We had a very sociable day yesterday at the races but not much joy with the horses - They both won Best Turned Out but then ran like hairy goats.... Kingsley we weren't expecting much from as he is a huge horse and is relatively weak so will need more time to strengthen up - However, we were very disappointed with Ted Thistle - He ran well for a circuit and a half and then suddenly pulled up. He was scoped this morning and although it was a bit dirty it wasn't enough to stop him but the vet thought it was more likely to be his wind which was the problem. Added to this we had tried him in a different bit as he ran away with Billy last time and we wanted to make sure it didn't happen again but possibly it was too severe for him as he didn't really pick up the bridle. So, depending on the results of the scope we may run him again next week with a tongue tie and a softer bit before we decide whether he needs a wind operation or not before the end of the season. Velvet Cloud is our star of the yard so far this season....Who would have thought it! Budge didn't go as he still has a puffy fetlock so he went as companion horse - He is going again today to keep Ted and Kingsley company at Guilsborough.